Would you like to know what season Lucy was smothered with chocolate? Made into a human popsicle? Drunkened with Vitameatavegamin (Hey, I spelled it, I think!)? Lyrics to Babalu IN ENGLISH? You have come to the right place! 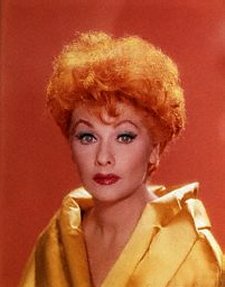 I Love Lucy was created from "My Favorite Husband," a radio program on CBS, when CBS decided to take the show to television. Lucy refused, unless Desi Arnaz, her Latin husband, could co-star. On April 25, 1951, they finally decided to buy the "Lucille Ball-Desi Arnaz Show" with Philip Morris Tobacco Co., Inc., as the sponsor. On October 15, 1951, "The Girls Want To Go To A Nightclub" aired at 9pm on CBS. The rest is history. "I Love Lucy" still airs daily in 80+ countries.